This module adds to Your OpenCart shop the payment methods available through MakeCommerce gateway. On top of that it will add also few shipment methods – automated parcel terminals of Omniva and Itella SmartPOST and Omniva courier service. Automatic registration of shipments into Omniva/SmartPOST systems can be configured, printing of parcel labels right in shop admin interface. The module version for OpenCart 2 requires vQmode. To install the module on server you either use Extension Installer or copy the module files to the server via some ftp client. Once the module files have been installed on server you should ‘install’ (or activate) and configure the module in the shop admin interface. 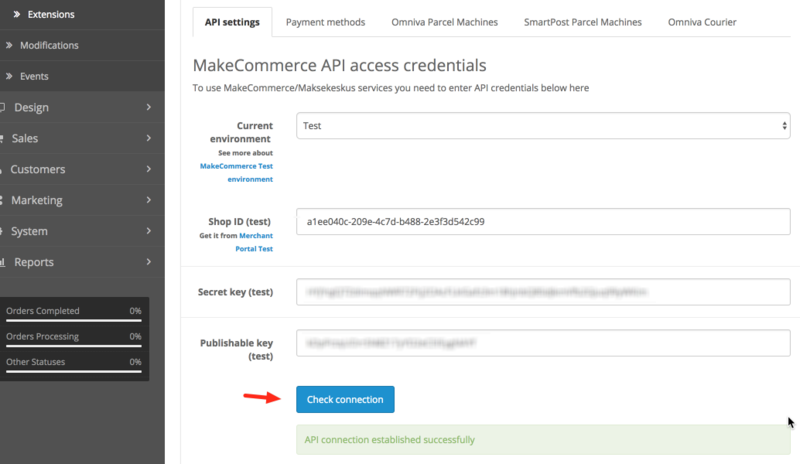 Next you need to configure MakeCommerce API connection. Enter your API keys and use the ‘Check connection’ button to verify. The module adds to the Shop a payment method named ‘MakeCommerce’. There are also few options to configure how the available payment methods are presented on the check-out page. They will olace respective dropdown lists with parcel terminals to the check-out dialog. You can slightly configure how they are presented. You can define their availability and price per Geo Zone, as well as purchase amount threshold for free shipping. The plugin can automatically create shipments into smartpost.ee and omniva.ee systems when the order has been paid. 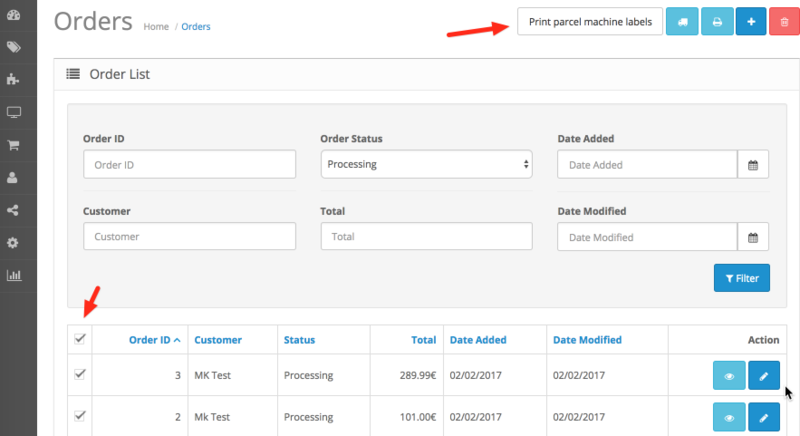 Once this automation is activated you can print out the parcel labels right form the shop administration panel (orders view). You can select all orders in processing state and with one click print out Omniva and Smartpost shipment labels mixed. 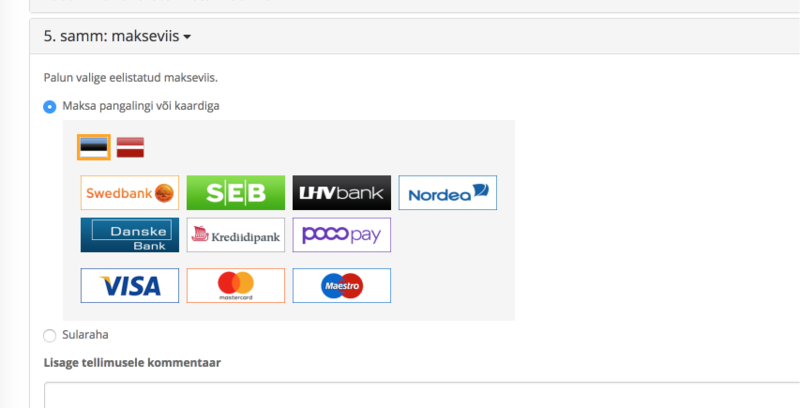 For this to work you have to sign up and create user accounts for your business at omniva.ee and smartpost.ee and then configure the plugin with username and password of those accounts. You will be assigned an account manager, you will find contacts in Omniva e-service. Send your account manager an email pointing that you want to apply for WebServices account. Once you get your WebServices account username and password, use them in the plugin’s shipment method configurations settings for the integration. If configured, the module will automatically create a new shipment in Omniva.ee system. The shipments going to parcel machine are created as “Parcel machine service” with “Parcel arrival SMS” and “Parcel arrival e-mail” (code PA+ST+SF). For the Ominiva Courier service you have 2 options – hand the packages over in Omniva Post Office (QP) or take the packages to a parcel machine (PK). The ‘service type’ is B2C – no manual work or confirming is needed (or even possible) in Omniva business customer e-service. You will see the shipments listed in omniva.ee e-service (under the list of shipments) only after they have physically handed over to Omniva. You (and your customer) can track the shipment anytime on omniva.ee webpage. For sign-up go to smartpost.ee sign-up form. Once you get the username and password use them in the plugin shipment method configurations settings for the integration. If configured, the plugin will automatically create a new shipment in smartpost.ee system when the order gets paid. You will see the SmartPost shipment number in order details. You can see the shipments created also in smartpost.ee self service interface.